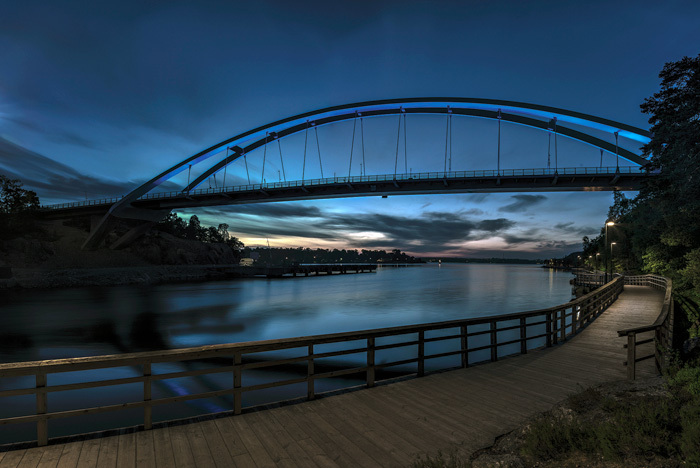 The lighting concept for the new bridge linking two cities just south of Stockholm is based on the idea of two luminous wedding rings, symbolising the union between communities. When the water of the river underneath is calm, the arcs of the bridge are reflected in the surface, creating two full rings visible from a distance, creating a new landmark viewed from land and water. The structure also had to blend well with the surroundings. The area is close to a wildlife reserve, so optics and shields were used to ensure tight control of the lighting, while the natural palette of white, blue and amber was chosen to harmonise with the sky at dawn and dusk. Studies were made to ensure that the correct amount of light would be evenly spread over the bridge, preventing glare. As with any road bridge, the functional and aesthetic lighting had to be balanced to ensure safe driving conditions. The amount of functional light decreases during low traffic, lending more focus to the decorative lighting. Luminaires were precisely placed and directed to follow the curvature of the form. 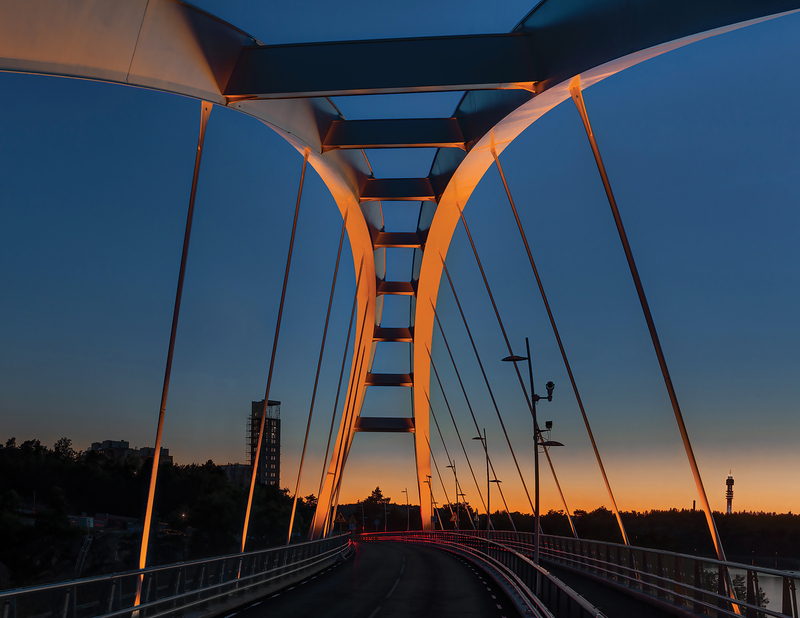 Working closely with the architects who designed the bridge, ÅF Lighting was able to influence the tone of the white-grey paint, which helped achieve the lighting result. Functional and decorative lighting are switched on and off through the municipal lighting system. A local control system automatically changes the lighting scenes for the arches, depending on time of day and the season. To achieve the best result, a solar study was conducted to identify the sun’s exact positions and angles throughout the year. 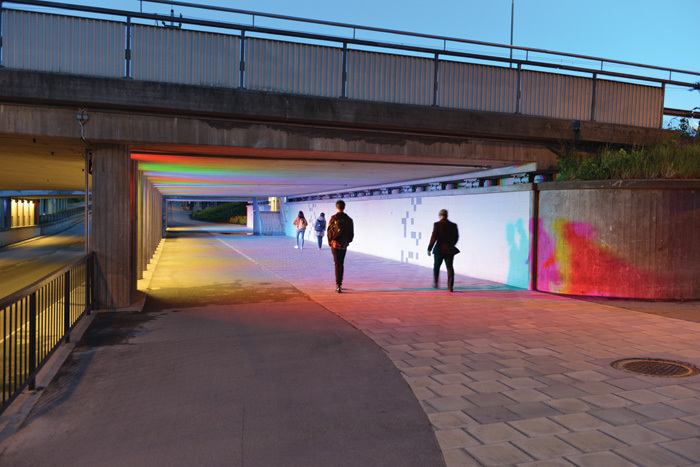 Transforming tunnels and subways from scary dark places into spaces that people might want to use has become quite widespread, and invariably it has involved introducing coloured light. Rarely, though, has it been applied with such a light and delightful touch as in AF Lighting’s award-winning scheme in Eskilstuna, west of Stockholm, in Sweden. The local authority wanted to turn a Stygian pedestrian tunnel into a more inviting place, but at minimal cost. The result is the Story Wall, which introduces subtle colour and a degree of animation provided by the pedestrians themselves. Approaching the tunnel, people will notice nothing more than the well-lit walls along the pedestrian path. 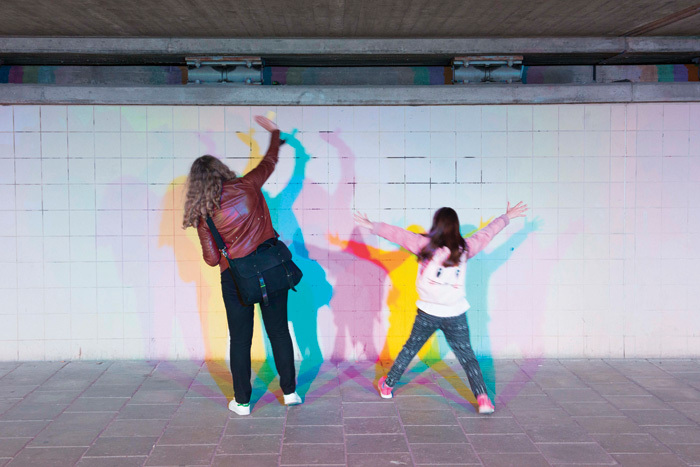 Once they step inside they can see that the lighting creates a colourful shadow show that mimics their movements as they walk, run or cycle through. Winning an Award of Merit in this year’s IALD awards and being highly commended in the Lighting Design Awards, the scheme’s main goal was to improve the local people’s everyday impression of their city, turning the tunnel into an attractive meeting point. Four months after installing the new lighting, the municipality reported that the tunnel has been used more frequently than before. 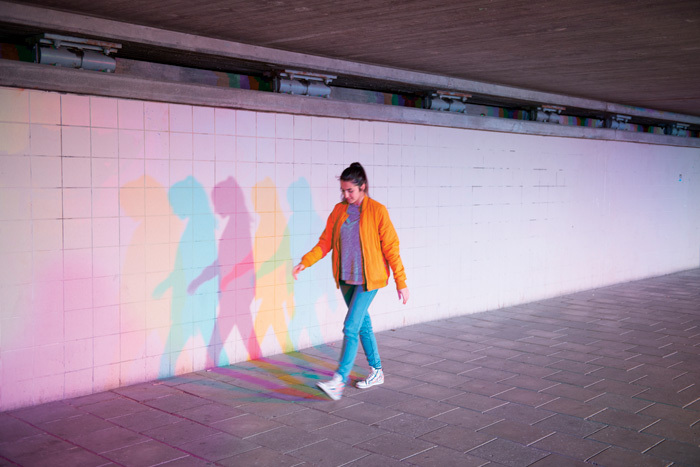 Single-colour fixtures in red, green and blue are evenly spaced between pillars, casting shadows from users as they pass by or play in the light. ‘Dozens of people, who would have passed through this space daily without thought for their surroundings given a more typical lighting solution, now find cause for delight and curiosity and interaction because of the thoughtful use of light,’ said an IALD judge.